We have a cat flap to suit all felines and all pockets, giving your cat the independence they demand without you having to open doors and windows every five minutes! 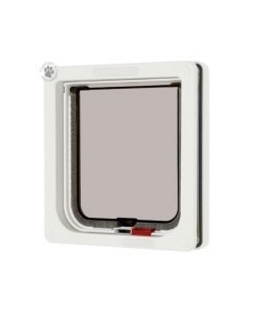 The standard lockable Cat Flap is the entry level design, with a simple slide lock. The Cat Mate 4 way locking Cat Flap offers you more entry/exit options: access only, exit only, open and locked; covering every circumstance. The magnetic Cat Flap is operated by magnetic collars (included in the pack), leaving your cat free to come and go as they choose. All of our Cat Flaps are provided by Cat Mate, a leading manufacturer of pet products since 1986. All of our prices include the fitting of the Flap into one of our doors at time of manufacture. 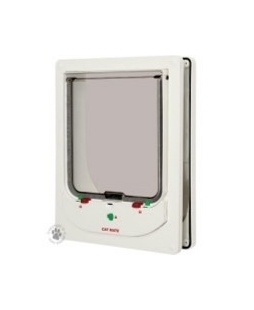 We are sometimes able to retro fit a Cat Flap into your existing door; please contact us for further details. To find out more about the Cat Flaps we have available, click on the 'read more' tab below. 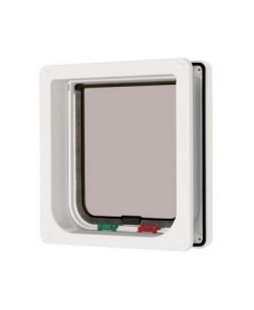 The basic Cat Flap design we offer, this is 13mm thick and is well suited to thin panelled doors. With a slide lock offering a simple locked and unlocked option, this no frills option is available in both white and brown. Access only: Your cat can enter the home, but not get out. Exit only: your cat can leave the home, but not re-enter. The electromagnetic cat flap from Cat Mate is battery powered and the access point is regulated by collar magnets, provided in the pack. Your cat will be free to come and go as they please and you can rest easy knowing only your cat will be allowed in.